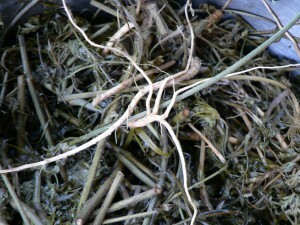 At long last, I have been processing some of my stash of retted and broken flax. 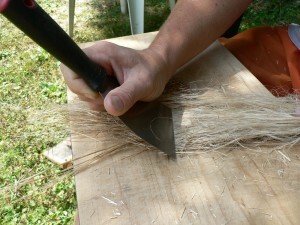 This process is traditionally called dressing, though I am not using traditional tools or techniques. However, I am having success using a variation on a method that Chris Hammel showed me, which utilizes tools from the kitchen and hardware store, and other tools that a fiber person might have lying around the apartment. Many of these bundles I believe were under-retted, which makes it hard to clean them. On the other hand, it’s not impossible, and I am feeling relieved not to have ruined several years’ worth of fiber. 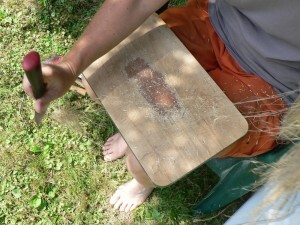 First, I “scutch” with a flexible 3 inch putty knife on an old wooden cutting board. All the small branches at the top break right off at this point. I’m not sure how useful they might be for other projects because they are still attached to the woody parts of the plant and I think they would be really hard to clean. I scrape them onto the ground. Some I put into the compost, and some I save in a bag for the time being. The photo below shows a clump of tow falling to the ground. I actually split my bundles into two or three sections for dressing. The size I originally tied when I harvested, which seemed fine for drying and retting, is too thick to handle all at once. I start at the branchy end of the mini-bundle first, then work down toward the middle. Then I flip it over, start at the root end, and work toward the middle. The middle is the hardest part to clean because the fibers are denser here. I spread it out into as thin a layer as I can and scrape and scrape. This part takes a long time. 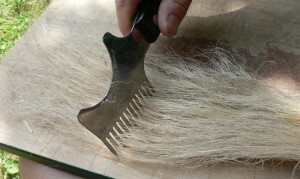 Next, I use a spiky comb-like tool that I bought at Leader Hardware here in Amherst. I don’t know what its real function is supposed to be, but it works very well as my “rough hetchel.” Chris says she uses a metal dog comb, which is probably similar. I like the fact that mine is spiky. I don’t know if the spikes really help or not, but I still like it. Yesterday I picked 8 and a half pounds of woad leaves. This is a lot, probably the largest quantity I’ve harvested at one time. 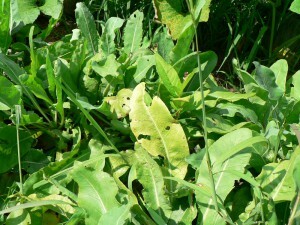 Many of the leaves are droopy and yellow at this point in the summer. It has been hot and dry, but there is a lot of color in them, so no worries. I had written earlier in the summer about woad’s enemies. 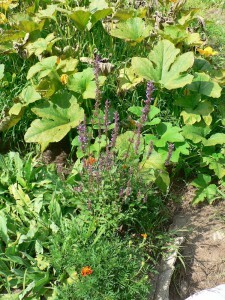 To fend off the cabbage whites, I planted two hyssop plants, which are supposed to help. I could only find anise hyssop, which may or may not be the right type. It definitely attracts the adult butterflies, as a food source I suspect. But I’m not sure it keeps them from laying eggs on the woad, and it’s the caterpillars that eat the woad leaves, not the butterflies. Here in Amherst I am happy to report that we have been having glorious weather for the past week. Flax retting, a modest amount of flax processing, dyeing, making salsa (not really in the scope of this blog, I know) are all continuing apace. For several weeks, the majority of this year’s flax has been drying on the hay tedder in the tractor shed over at Amethyst Farm (thanks to the generosity of the Brennans). To make room to move this year’s crop gradually into the back of our car (which serves as our shed) I had to ret last year’s flax. I posted about that earlier. That is now all complete. I retted the first batch (from our community garden) in the 50 gallon tank. 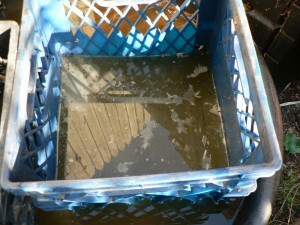 I didn’t change the water at all during the retting period (from July 27th to August 2nd–six days). Here’s how the water looked when it was ready to pull out. Note the yellowish grey film on top. 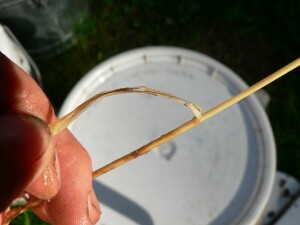 At the flax demonstration in Gilmanton, NH, Gina Gerhard had given Faith and me a tip on how to check when your retting is complete: the fiber should pull away from the stem with absolutely no resistance. I recently heard a little rhyme about the growth habits of perennials that I couldn’t believe I had never heard before: Sleep, creep, leap. This year my yarrow finally got to the “leap” stage. 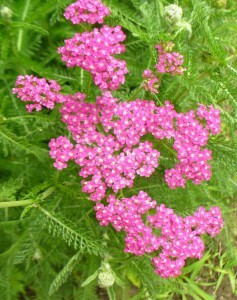 Yarrow, of course, grows wild all over the place and there isn’t necessarily any need to cultivate it. I have only seen it as a white-blooming wildflower (Achillea millefolium, I believe) which sometimes has a purplish or pinkish tinge. It is beautifully frothy and creamy looking. But I do cultivate it because it comes in such beautiful colors, and I have tried several varieties in the garden over the years. For some reason, the red, yellow, and orange ones have not survived, but this year my pink-flowering ones were lush and tall and bloomed in abundance. 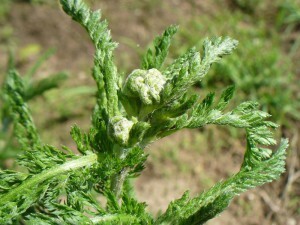 Here is a young little yarrow plant early in the spring. It is feathery and burly at the same time. It looks a little bit like Queen Anne’s Lace when it’s young, and they often grow in similar places. 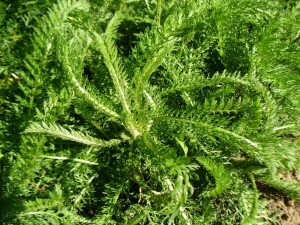 But yarrow is fuzzier, almost furry, and more dense. Here are some buds. At this stage it can look velvety and fuzzy and silvery grey. Since Queen Anne’s Lace has been so abundant this year, I wanted to experiment with using the entire plant, roots and all, for dyeing. Quite a lot of plants needed to be weeded out of our garden plot, so on August 2nd I decided to try it. I was pretty certain it would make yellow, which is the most common color from wildflowers, but you never know until you try. So, I do try to prove everything with my own efforts. And I try to persevere with each problem. Hopefully over the years I solve some of them. On Saturday July 28th I took a long drive up to Gilmanton, NH to meet flax dresser Gina Gerhard, and to see a newly excavated historical flax retting pond. Fellow flax aficionado Faith made the long journey, too. Even though it is too late for you to see Gina in Gilmanton, it is not too late for you to enjoy Faith’s absolutely outstanding interactive program about flax at the History Workshop at Historic Deerfield.